That is so awesome! They should totally add giant endermen to the game that go around stealing entire villages or something. No Minecrafter_jack! Don't give Notch those kind of ideas!! NO!!! I swear if Notch adds those into the game I won't update ever. I just realized that one block of grass is in comparison to your house? eDark Pony ftw? Click the little plus sign over there ---> if I helped you or made you laugh? Now you just need a giant crater. Help me get a Frontline Field Recorder! You don't even have to watch the whole thing! They'll go around lifting up Chunks? I can just imagine having a giant house and 47% of it missing cause of the Chunkman. 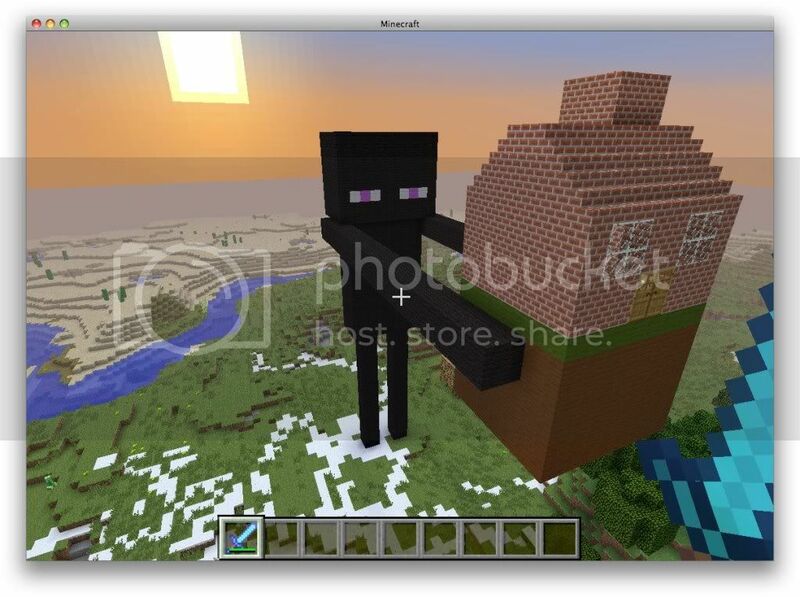 You are looking right at the giant Enderman. Repulsive240, The Official Suggestion forum shark! He shouldn't add giant endermen?! are you out of your mind?! If he does, there should only be like 5 and it should be a boss level/area. Once I learn modding better I am so going to make this. IT will steal entire chunks, and you should be very afraid. Was one of the collaborators who worked with LEGO on the original Minecraft set.